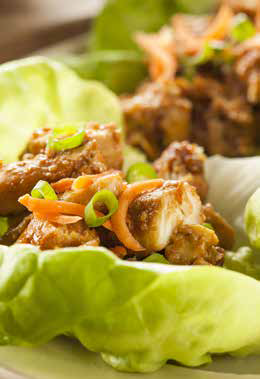 Who doesn’t love healthy, low-calorie lettuce wraps? Crunchy vegetables, buttery lettuce and small portions of meats with various dipping sauces combine for delicious meals that are eaten with your hands. The secret to a good wrap is bold spicing, along with a mixture of textures and crunch in the fillings. Almost any lettuce will work as long as the leaves are pliable. Wash the lettuce, dry it, and separate the leaves. Set aside. Mix together the sauce ingredients. Heat the sesame oil in a wok (or a non-stick frying pan) on high heat. Add the garlic, ginger and green onions and fry until the garlic and ginger are aromatic. Add the chicken and cook until it is browned. Remove the chicken from the wok and set aside. Add the red pepper, water chestnuts and celery to the wok. Add the sauce ingredients and cook at medium heat. Give the cornstarch/water mixture a quick re-stir and add to the sauce, stirring to thicken. Add the chicken back into the wok. Cook for 2 to 3 more minutes, stirring, to heat through and finish cooking the chicken. Lay out a lettuce leaf and spoon a heaping teaspoon of the chicken and vegetable/ sauce mixture into the middle. Fold into a package. Continue with the remainder of the chicken mixture and lettuce leaves, and serve. Per Serving: 274 Calories; 7g Fat (22.6% calories from fat); 1g Saturated Fat; 37g Protein; 14g Carbohydrate; 3g Dietary Fiber; 88mg Cholesterol; 393mg Sodium. Exchanges: 0 Grain (Starch); 5 Lean Meat; 2 Vegetable; 1 Fat; 0 Other Carbohydrates. — Recipe courtesy of LowFatLifestyle.com. Visit them for more free recipes and healthy-cooking tips.